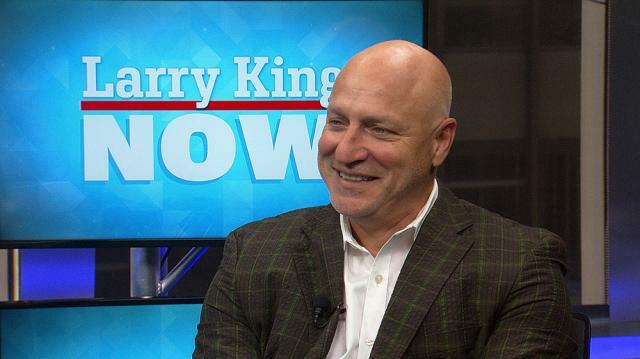 ‘Top Chef’ head judge Tom Colicchio gets candid about initially turning down the hit reality show, his work to reform agriculture policy in the United States, and why he wants to abolish tipping in his restaurants. Plus, the six-time James Beard winner on the chef he’d trade places with, and his favorite food cities in America. “I was a short order cook and the guy who was running it hired me to scoop ice cream and work the cash register, and within a week I was cooking. Still to this day the best job I ever had.” — Tom Colicchio on his start in cooking. “Opening. Opening a restaurant, you know that you are going to be visited by any number of food critics and you can't make a mistake.” — Tom Colicchio on the hardest thing a chef can do. “It works because I think we have a combination of, you know, people who like reality TV, there's something for them, and people who are real foodies, really care about food, and care about food on a much higher level than some of these other shows. I think they come to see, you know, how people can cook.” — Tom Colicchio on the success of Top Chef. “I think it has a lot to do with society in general and what women have to do to have a successful career. Especially, you know, a career that mostly happens at night, and a lot of young women drop out at a certain point and I think if we had a better child care system in this country and we had other ways to support women... I think there’d be more women chefs.” — Tom Colicchio on why professional cooking is a male dominated industry. When you think about if you go to see piece of classical music, you're going to see a symphony, usually the person who wrote the music is long gone, there are some contemporary composers, but who gets top billing? The conductor. And you don't expect that conductor to jump in a pit, start playing, and they probably can, but it'd be pure chaos. And so that's what a chef does in the kitchen, the chef is there to write the music, we write the menus, they're our dishes, our way of producing that food” — Tom Colicchio on the role of the chef. “I think for this restaurant, what I want to do is go back… So, you know, my food has changed from having more French influence over the years, to having more Italian influence and so I want to go back to maybe...I'm not calling it a French restaurant, but I want to have more influence of butter, less olive oil.” — Tom Colicchio on his new restaurant, Fowler and Wells. “We choose to subsidize corn, wheat, soy, cotton, and all the commodity crops that go into creating highly processed foods, and so it's very easy to demonize someone for feeding their kids, you know, soda and chips and stuff like that. That's cheap… And so if we can make nutritious food inexpensive, I think more people will turn to nutritious foods. And so, we have to have a policy that will support healthy foods, make healthy foods more affordable, more accessible.” — Tom Colicchio the flaws America’s food production. “We have a lot of calories in this country which will lead to obesity, people will overeat. But those calories are cheap, nutritious calories are expensive.” — Tom Colicchio on why America has an issue with obesity. “I just don't see why, professionals, waiters who are working in in great restaurants, why they want to be subject to someone's whim it comes to paying.” — Tom Colicchio on getting rid of tipping. “There's restaurant called MIMI's and the chef, I believe her name is Liz Johnson, she's 25 years old, and for me to go back and be a 25 year old chef, knowing what I know now would be pretty cool.” — Tom Colicchio on which chef he would like to switch places with. “The word chef doesn't mean that you have some magical powers, that you can cook better food than somebody else, it simply means boss, that's all it means.” — Tom Colicchio on what his title really means. “Craft, because the style of cooking that we're doing in that restaurant is very simple cooking, it was really about the product, and so to me it was more about the craftsmanship of cooking, less the artistry of cooking.” — Tom Colicchio on why he named his restaurant “Craft”. “I think it's become a little fetishized. You know, I always say that we do in a restaurant, nobody dies on the operating table, it's just food. Let's take it easy,let's go enjoy ourselves.” —Tom Colicchio on foodie culture.